← Time Spent With Lifelong Friends. A Long Jetty and a Tall Lighthouse. On the road again and travelling through some wonderful little towns in southern Western Australia, what could be more perfect. Pinjarra, early lunch stop at a great little bakery which was very popular; Waroona; Yarloop the town that was burnt out only six to twelve months ago, so sad to see but they haven’t given up; Harvey with all its horse studs; Brunswick very rural and plenty of dairy farms. All these little places just pop up and leave a mark on your memory for their uniqueness. Busselton, a very lovely seaside town about 300 kms from Perth, this was where we were spending the next three nights at the Kookaburra Caravan Park. This was a very neat little park with great facilities including an indoor camp kitchen and outer BBQ area and a great location not too far from the shops. Quick set up of the camper because we would be using the camp kitchen for our meals as it had everything we needed and our camp was right next to it and the ammenities. Off we went for a walk down to the beachside and jetty where we found the tourist information centre to grab all the information we needed on Margaret River, Augusta and find out just what Busselton had to offer. Then a walk into town to check out what was around and get some fresh rolls to go with our dinner of pumpkin soup, which I had made in Perth and frozen. We made the most of the kitchen that evening face timing the boys for a chat, we had our heater set up in there to keep us warm while we enjoyed the comfort of the indoors away from the cold evening, warm soup and the company of our neighbours, Barry and Tess Guerin, whom it turns out are from Figtree near Wollongong and Barry worked with our neighbour and friend, Tony, before he retired twelve months ago. Small world again. Our first morning we took ourselves across to the Jetty where we wanted to visit the underwater observatory and walk the Jetty but due to the weather tour was closed and as it turned out it would remain closed for the rest of our stay as it wasn’t a clear view from the observatory. Back to the caravan park to regroup and, decision made, we headed to Margaret River and Augusta for the day. First we headed across the coast to Dunsborough and Simmo’s Icecreamery where we enjoyed a delicious treat that left us very cold inside and out. We both had two scoops, mine were salted burnt caramel and coconut, Murray had salted burnt caramel and hazelnut nougat. Yum! Now, off to hit the wineries and whatever else we can find along the way. First stop was the Cheeky Monkey Brewery and Distillery and Killerby Winery, we were on a mission for Dave and Leonie Bere back home for a bottle of Liqueur Shiraz they liked. What a shame I had to do the tasting for them. The pear cider from the brewery was just lovely but not on the shelf for purchase yet. We did go to Willespie Wines for our friends Bec and Kev but it’s was closed on Wednesdays so I’ll just have to come back over another time. Murray wasn’t too interested in the wineries as he was driving and it wasn’t as much fun for me without a drinking buddy, Sharyn, so even though the weather wasn’t the best we decided to forego some wineries and take the drive to Augusta and Cape Leeuwin Lighthouse. 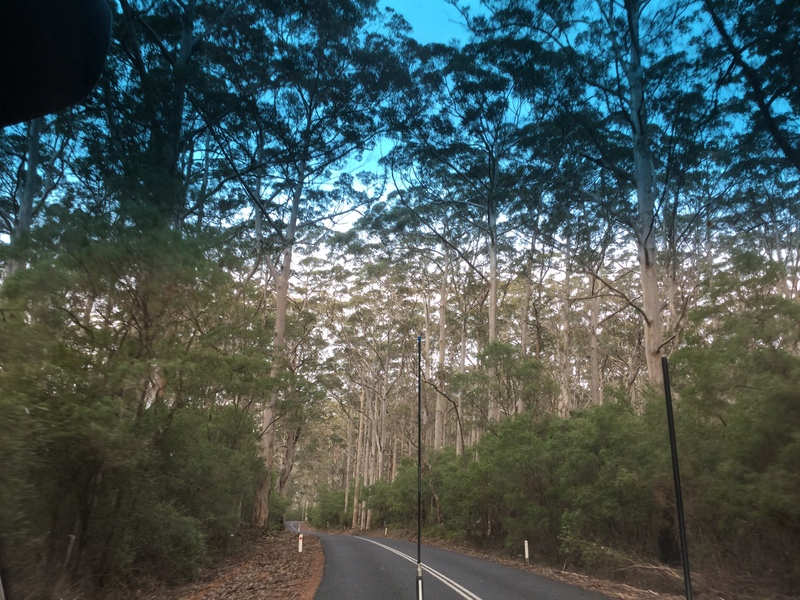 The drive down was just spectacular as we passed through Leeuwin-Naturaliste National Park and Boranup Karri Forest with its huge trees that towered way above everything else. Cape Leeuwin lighthouse is 56 metres tall and has 176 steps to the top, it is the tallest mainland lighthouse situated at the most south westerly tip of Australia, where the Indian Ocean meets the Southern Ocean, it also overlooks Flinder’s Bay. Our guide was fabulous and very informative, we could tell he loved his job by the smile on his face the whole time he talked. On our trip home we called into the Margaret River Dairy Company and tasted the most beautiful cheeses and yoghurts and made sure we didn’t leave empty handed. The next morning we returned to the Busselton jetty and did the 1.8km walk out. It was very windy and cold but well worth it. It’s the longest wooden jetty in the Southern Hemisphere. After our excercise on the jetty we took the drive back down to a winery called Aravini where the owner has a collection, 10, old cars within the showrooms. This place was amazing, the cars were beautiful and so were the wines. We were both happy with this place. Another great day finished off with a catch up with Tess and Barry, a night walk to the jetty for some night photos and another dinner in the warmth of the camp kitchen. Busselton, what a lovely place to have visited. The next part of our trip would change again but that’s another story. Till next time. Traveller, Cook, Blogger, Teacher's Aide, Swimmer, Mother, Wife and yoga lover. Now retired and enjoying me time. This entry was posted in Adventure, Challenges., everything, Life, Love and Laughter., New People, Travel, Western Australia. Bookmark the permalink. adventures in travel, life and cooking.